Frozen freshly squeezed orange juice "guitar" - a very good treat! First, I want to thank everyone, who replied to my last post in comments, e-mails and phone calls. I am truly touched by amount of warm words I received. I appreciate everyone, who sent me an e-mail with a personal stories and own struggles with their weight loss. I was emotionally overwhelmed while reading through it. While I am on a mission to respond to every e-mail, comment, message, one question was almost in every e-mail: "What do you eat? Please share!" I am not a professional nutritional adviser, nor I am a dietitian, all I can share is my personal adventure. It began with analyzing of what and how much I eat. On the "What" part I had to keep some sort of unwritten diary: how does it make me feel after I ate it? Light? Heavy? Tiered? Energized? Sleepy? Active? and so on. It's a process of re-discovery of real good eats, and it's a fun process. But a few foods are aliens on my list, and I limit them from a very little to none: sugar, processed foods, baked goods, fats. Let me start with the Sugar. I thought I can't do it and I can't live without it, although I am not a big sweet eater. Surprise! I can live without sugar, or too much sugar in my case: not more than 1 teaspoon of sugar. But I had to negotiate sugar intake with myself. My rule: no white sugar. Period. It is the most unhealthy sweetener out there, along with artificial ones. Sucanat, turbinado, agave, honey, maple syrup - those products live in my kitchen. Stevia? I am not a big fan of it. Another rule: no sweets after 2PM. I have to burn all those calories sugar has before it becomes fat in my body at night. And it doesn't mean that I have to run. Just basic daily activities need energy, even sleeping, although that's not what I do. Was it hard for me to stick to my plan? Not really. I had some withdrawals for about four days, but is wasn't something painful. I can easily control my cravings with a 5-7 walnuts and 1-2 dried fruits (no sugar, no oil, no sulfur added). One person asked me how can I stay away from all the sweet food around: in the refrigerator, in the cupboard? Easy, I don't have it! That's right, not even a box of a cereal. Why? 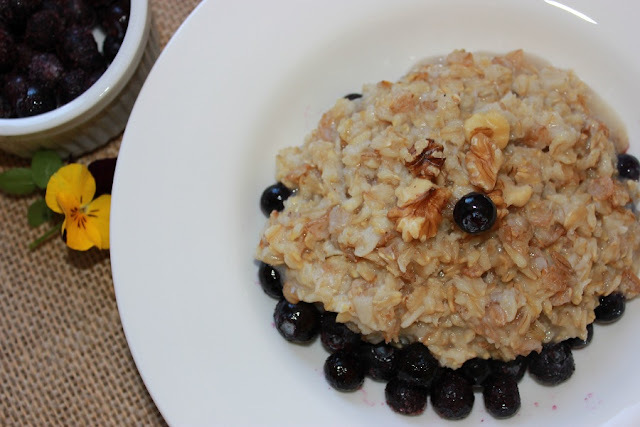 The real food, like rolled oats and rye with some blueberries taste so much better and have such a great nutritional value, that no cereal can match it. It makes me feel good and energized. Isn't it what eating is about: feeling good? Next time: what kind of fats live in my kitchen. Disclaimer: Please, consult a medical professional prior to changing your diet or starting an exercise program. I have to agree with all your great ideas/suggestions. Cereals are sugar loaded except for oatmeal that I love. Love you orange guitar! Thank you Rita. I went the simple way and find it's interesting to re-discover the taste of a whole simple food. I agree with you. I find that I don't crave as much sugar as I used to. It is like a drug they say and the more you take the more you need. It is all a habit after all. I never buy those industrial things called "cereals" these days because they contain mostly air and sugar, very little nutrients in there. 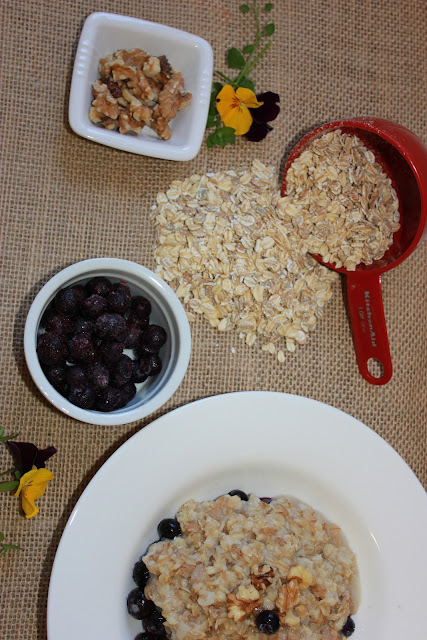 What a difference a nutricious slow cooked porridge; it tastes so good and only takes 10 minutes to prepare! Well done for your guitar, great work! Thank you Alida! I agree with you completely: it's all about our habits and how they change through our lives. That guitar is so cool...where does one find a mold like that? I found one at our local TJ Max. I'd like to have another set: it is really cool for a party. I had some friends for lunch, they were very impressed with it. I like everything guitar: music, sound of it, and it's shape! :) My husband plays guitar so I collect cute guitar shaped stuff. Thanks for visiting! Thank you Lorraine. You are so sweet! I am not where I want to be yet, but on my healthy way! 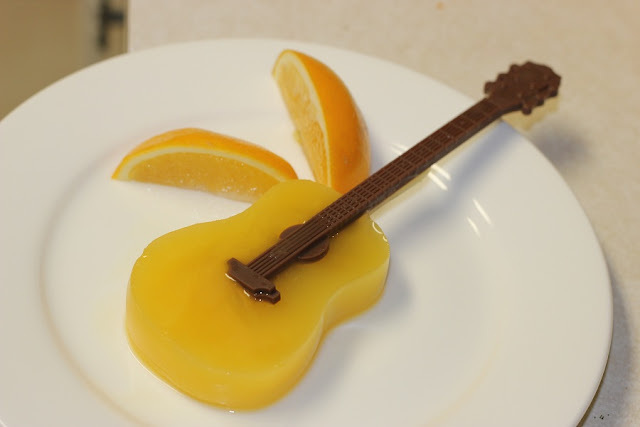 The orange juice guitar looks great,it's too good to be eaten! When I'm stressed with not enough sleep/rest, I will loss weights. Other than that, I've read from somewhere that work out how much of calories you need daily & don't eat more than what you need. Make sure you make yourself busy!Hope this help! Jessie, you are so right: don't eat more than you need. We tend to forger how actually little we need. That orange juice guitar pop is so cool. Great food choices. Hope you have a wonderful day. Thank you Suzi! I love that guitar too, it really makes me smile and sets a jazzy mood! Thanks for sharing these valuable eating tips, Marina! They are so helpful.